CEED 2019 result has been announced by IIT Bombay on March 04, 2019. The candidates can check their CEED Result online at ceed.iitb.ac.in or by accessing the direct link on this. As per the official website, 1165 Candidates Qualified in Common Entrance Exam for Design (CEED), out of the 5491 candidates who appeared for CEED 2019. The entrance exam was conducted on January 19, 2019. CEED is a joint entrance examination held for admission into Master of Design (M.Des.) offered at IISc Bangalore, IIT Bombay, IIT Delhi, IIT Guwahati, IIT Hyderabad, IIT Kanpur, and IIITDM Jabalpur. The score of CEED is also used for admission in Ph.D. at IISc Bangalore, IIT Bombay, IIT Guwahati, IIT Hyderabad, and IIT Kanpur. Candidates can further scroll down our page to find in detail the list of courses offered by the respective IIT’s and in-depth information regarding CEED 2019. Latest: The result for CEED 2019 has been announced. Click Here to check it. Candidates are to note that the selection process for CEED 2019 is based on qualifying the CEED 2019 entrance exam along with clearing the test/interview as to be conducted for the qualified candidates by the respective Institutions namely- IISc Bangalore, IIT Bombay, IIT Delhi, IIT Guwahati, IIT Hyderabad, IIITDM Jabalpur, and IIT Kanpur. The candidates can check the complete schedule for CEED 2019 from the table below. Results for CEED 2019 has been declared online. The result is announced at the official website of the exam. To check the result the candidates need to log in by entering their Email ID and Password. Along with the result, CEED Scorecard has also been released at the Candidate portal. The scorecard consists of the details of each individual performances. IIT Bombay has also announced the name of the top 3 rank holders who have topped the exam. The question paper will be divided into two parts. Part A and Part B. The cut-off for Part A marks for shortlisting candidates in the Open category will be X + ½ Σ, where X is the average marks obtained by all candidates in Part A, and Σ is the standard deviation. The cut-offs for shortlisting candidates of OBC-NCL category candidates will be 90% of the Open category. The cut-offs for shortlisting candidates of SC, ST, and PWD categories will be 50% of the Open category. Part B answer books will be evaluated manually for the candidates who are shortlisted from Part A. The final Answer Key is now released. The answer keys for CEED 2019 has been provided for the candidates who have appeared in the examination, so that they may check and match their given answers with the correct answers mentioned in the answer keys. This helps the students in knowing and understanding the mistakes they made in their response sheet. And would allow them to check whether they would be able to successfully qualify in the Tests or not. CEED 2019 has released their official answer key of CEED 2019 as scheduled. Within a duration, candidates are asked to send their comments on the Answer Key in case of discrepancies. Click here to check the final answer key for CEED 2019. Click here to check CEED 2019 question paper. Click here to check the draft answer key for CEED 2019. Here, for the convenience of candidates, we have listed in detail the programmes that will be offered through CEED 2019 at the following IITs and IISc Bangalore for M.Des. and P.hD. Candidates are to foremost note that Master of Design (M.Des.) will be offered for admission at IISc Bangalore, IIT Bombay, IIT Delhi, IIT Guwahati, IIT Hyderabad, IIITDM Jabalpur, and IIT Kanpur. Whereas the Ph.D. programmes in Design will be offered at IISc Bangalore, IIT Bombay, IIT Guwahati, IIT Kanpur, and IIT Hyderabad. As per the information brochure for CEED 2019, for these programmes at IISc Bangalore, IIITDM Jabalpur and IIT Kanpur, GATE qualified candidates are also eligible. The admit card for CEED 2019 has been issued and the candidates can download it from the official website. To download it, the aspirants need to enter their Email ID and Password. Issued admit cards will carry respective photograph and signature as submitted by the candidate during the filling of the registration form. Candidates are instructed to download CEED 2019 admit card and bring a colored printout copy of it on the day of examination. 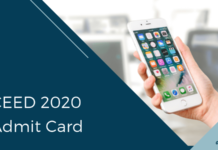 Candidates who had been issued CEED 2019 admit card if find any discrepancy in the same had a provision to send in their admit card for rectification. As per last year’s rectification date, the window for the same will be given sometime during the 1st week of January 2019. 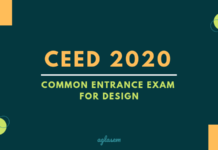 In order to attain a good rank, it is crucial for the willing candidates appearing for CEED 2019 to have a clear idea regarding the examination pattern. Below we have laid out in detail the key features of CEED 2019, as per last year’s implied pattern. Mode of Part A: Computer-Based Questions with answers to be marked on the screen itself. Mode of Part B: Computer-Based Questions with Answers to be marked on the then to be given Answer Book. Part A: Multiple Choice Questions, Multiple Select Questions, and Numerical Answer Questions. 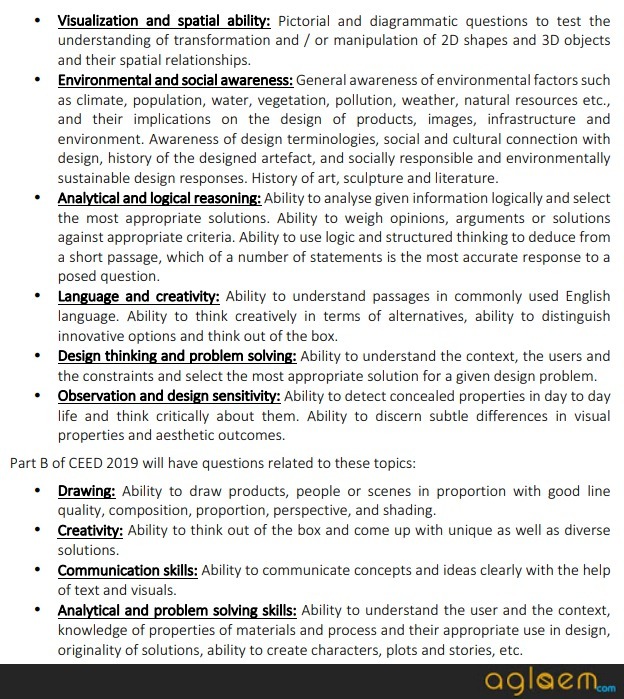 Part B: This section will have questions based on testing the design of candidates, drawing, and writing skills. Weightage of Marks: 25% weightage to marks obtained in Part A and 75% weightage to marks obtained in Part B.
CEED 2019 will be broadly classified into two parts A & B. Students are requested to go through each of the parts for the better preparation. CEED 2019 will be an aptitude test and therefore no specific textbook or guide is suggested for the candidates to refer for the preparation. Nevertheless, candidates may practice their drawing, rendering and visualization skills. Part A of CEED 2019 will cover the areas of Visualization and spatial ability, Environmental and social awareness, Analytical and logical reasoning, Language and creativity, Design thinking and problem solving, Observation and design sensitivity. Part B of CEED 2019 will cover the areas of Drawing, Creativity, Communication skills, Analytical and problem-solving skills. The preparation of CEED 2019 will mainly depend on the individual’s ability to understand the designing, creativity and the knowledge about the subject. As there is no official textbook prescribed for the preparation, there sure is a lot that can be done by the candidates in order to obtain a good CEED 2019 scorecard. It is crucial for the candidates to note that CEED 2019 will tend to ask questions about general awareness and the questions which will require critical thinking and problem-solving techniques. Keeping all of these in mind, it is advised for candidates to start their preparation for CEED 2019 with extreme diligence by managing time and focusing more specifically on their weak areas. Here are a few quick points suggested for the CEED 2019 aspirants to keep in mind while preparing for the examination. Explore & give your creativity wings- Candidates are advised not to limit within the circles but let the ideas flow by getting in touch with the maximum number of things one can get which relates to the subject. This will enhance creative ability to solve design-based problem. Candidates are advised to take some time for training when it comes to improving their abilities to sketch or assimilate some design knowledge. Think outside the box- It does not require a textbook approach but the test celebrates the original thinking. So copying ideas will not work rather a potential candidate should enhance the horizons of thinking. Try to think of different ways you could use the answer sheet to present your answers. Sketch and Perceive- Watch and learn as much as you can from the online and offline drawing tutorials. Sketch as much as you can. By the time you write the exam, you should be able to draw everyday objects like fruits, vegetables, cars, table and all forms of life skills from your mind as far as possible in 3D perspective. Practice speed sketching cause there are lot of questions and you have less time to think and execute. Read Comic strips daily, sometimes questions are asked to represent a storyline, say, how will you plant a sapling. This will need your sketching skills as well as story-telling ability. Illusions and Perception. Observation and visualization skills- What you see is what you draw but it is what you “see” in your mind that bends your creativity toward its pinnacle. Develop this kind of visualization. Try to get the best picture of what you want to sketch in your mind, think about it and then sketch. Solve puzzles to improve observation like tangram puzzles. Working with Geometric Objects including solving geometric object type of questions which improves imagination as well as visualization skills. Polish General Awareness- Since it is an examination for designing so the students shall expect general awareness questions from every walk like the famous architectures around the world, famous bridges, famous buildings etc. Read books related to drawing instruments, holding positions, quality of lines and shading techniques, which covers most of the rendering topics including perspective projections. Candidates are advised to sketch their answers as much as possible rather plainly writing the answer into words. Doing so will help the candidate understand his/her creativity and the proficiency of the sketching skills as to be applied during CEED 2019. Coloring will definitely add a value to the answers. It is advised further to go through the previous question papers and try to answer as many of the questions as possible. Candidates preparing for CEED 2019 may also join a Design and Sketching course so as to improve their designing skills. Should have passed the GD Arts diploma programme (10+5 level) by July 2018. Age Limit: There is no age limit to appear for CEED 2019. Also, candidates can appear for CEED any number of times. 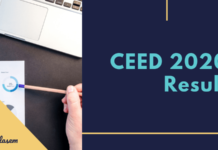 Once the candidates have checked whether they meet the eligibility criteria in order to register for CEED 2019, the second step in the CEED 2019 admission process is to register for the same. Candidates are hereby informed that registration and submission of registration form for CEED 2019 has to be been done only in the online mode from the official website. Candidates applying will foremost have to register. For registering online, a valid email id a per candidate is to be given. Candidates will have to verify this email id in order to generate their login credentials. Candidates will have the provision to register first directly through their Gmail account. Post registering online for CEED 2019, candidates will be directed to the registration form filling page. Here they will be required to fill in the relevant information like Personal Details, the course for which they will be applying for and so on. To finally submit the CEED 2019 Application Form, the aspirants need to pay a requisite amount of the application fee as given below. Note: A late fee of Rs. 500 is applicable to all candidates for registrations submitted after the regular closing date till November 16, 2018, 23:45 hours. For more information on CEED 2019, candidates can download CEED 2019 Information Brochure.